The Wasatch Front North (Davis, Morgan and Weber counties) is often viewed as a single region. The reality is they each have distinct economies and experienced differing recessionary impacts and recoveries. For instance, Davis County is tied closely to Hill Air Force Base (AFB) and U.S. defense spending. This helps to stabilize the region. Morgan County is a growing bedroom community, but most new construction halted during the recession. Weber County has a vibrant and diversifying economy, but lacks a significant recession-resilient core to soften the severity of economic downturns. Davis County experienced a mild contraction during the recession in comparison to Utah’s other counties, losing only 4,000 jobs and falling by 3.6 percent. The downturn was short-lived, too. Davis County started expanding again at the beginning of 2010, and regained its pre-recession employment by late 2011; a time when most other counties were just turning the corner and starting to rebound. There is no single sector that dominates Davis County’s economy, but Hill Air Force Base functions as the primary engine for economic growth and stability — accounting for about 10 percent of total county employment (around 12,000 civilian employees). During recessions demand falls for many nonessential goods and services, but government defense spending is historically stable. During the recession, Hill AFB employment dipped slightly for a few quarters and then picked up helping to prop up the local economy. Defense contracts bring steady jobs and the people filling those jobs bring their families to live in the area. This adds to health care services and education demand. Both provide recession-resilient jobs. The health and education sectors combined continued to grow during the recession, and have provided the single most consistent employment growth since the recession’s end — adding more than 8,000 new jobs to Davis County since 2007. Retail trade is the next largest industry in Davis County. In most local economies retail growth follows the lead of other “core” industries, primarily serving the local population demand. Due to its location along a major commuting artery and its targeted growth strategies, Davis County has developed a retail industry that serves a significant number of consumers from outside the county that brings money into the local economy. Retail trade employment is typically sensitive to economic downturns, but in Davis County it only dipped slightly and then came back strong — averaging more than 3.0 percent growth since 2011, and even adding additional retail space in areas such as Station Park in Farmington. Thanks to its diversity and recession-resilient core, the Davis County recovery has been steady and shared across many sectors. Current employment now sits at about 124,000 — nearly 25 percent higher than its pre-recession count. Growth at Hill AFB and the related IT, engineering and manufacturing jobs it spawns boosts the local economy’s vibrancy. Professional, technical and scientific services have been expanding employment at a rate of about 4.7 percent annually on average since 2010, adding relatively high paying jobs that will only help to further stabilize the region in the next cyclical downturn. At the beginning of 2008, Weber County’s employment was nearly 97,000. By 2011 that number had dropped to around 90,000 — a more than 7.0 percent decrease. Drawdowns of both goods and service industries contributed to the decline. Auto parts and aerospace manufacturing jobs dropped sharply with large layoffs at Autoliv and Williams International, among others. Business and employment services jobs sagged as well, especially among telemarketing establishments and temporary work agencies. The construction sector shed some 3,000 jobs over the time period — in both residential and non-residential construction. Nearly every sector was affected negatively, except for education and health care services, which tend to be relatively resilient to economic downturns. Weber County’s recession resilient industries are not quite large enough to act as a buoy when the rest of the economy is struggling. The IRS is the county’s single largest employer, and those federal jobs tend to be stable even through recessions. But it still only accounts for about 6.0 percent of total employment. Weber State University is a major stabilizing employer in the region, as well — as are the local hospitals (McKay Dee and Ogden Regional). Education and medical care tend to be recession hardy, but even those employers combined still only make up about 7.0 percent of county total employment. Their share of the economy was not large enough to absorb other large job losses and counteract the fall in overall consumer demand. Granted, without these stabilizing industries the recession might have been much worse for Weber County. The recession hit Weber County hard, but it did not stay down long. By early 2011, the economy was on the upswing and has grown at an average annual rate of about 3.0 percent since. The pre-recession employment peak of 97,000 was regained by 2014, and now the county sits at about 105,000. The rebound has been driven by some of the previously prominent industries as well as some new players. For example, auto parts manufacturing has added back all the jobs lost during the recession plus 500 more (largely at Autoliv). Pharmaceutical manufacturing (primarily Fresenius in Ogden) has doubled its share of county total employment since 2008, adding more than 600 jobs over that time. In addition, business support and temp work agencies have returned to pre-recession levels. But the really interesting county newcomer is non-store retailing. Prior to the recession online retailers were virtually nonexistent in Weber County — but the arrival of Wayfair in 2011 changed that. There are now nearly 1,000 jobs in the industry. The rise of these new industries suggests that Weber County’s economy is further diversifying — a valuable element to help protect against future industry-specific downturns. 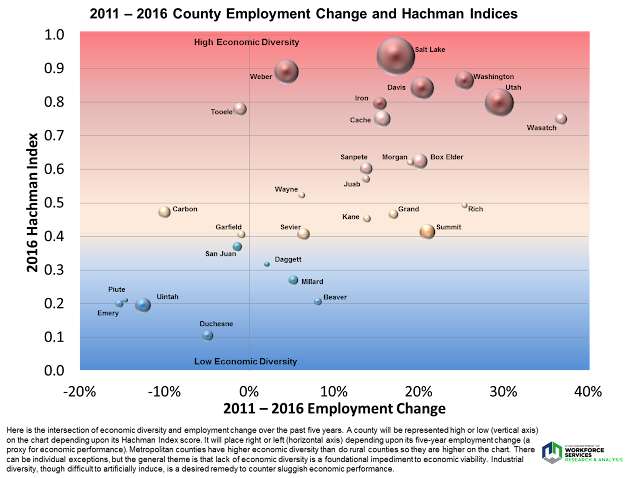 But diversity is not the only factor that mitigates recessionary impacts. Large recession-resilient employers (like the IRS) act as stabilizers, but the IRS has been downsizing (more than 1,000 jobs since 2011) which will reduce Weber County’s recession-resilient core. Morgan County lost about 300 jobs — or roughly 15 percent of its 2008 employment during the last recession. Pre-recession peak employment was nearly 2,000, and by 2012 that had dropped to almost 1,700. Construction was hardest hit, shedding upwards of 180 jobs and accounting for the majority of job losses. Morgan County has a large and growing share of residents that commute outside the county for work. New residents moving in were driving strong residential construction demand prior to the recession — 105 new residential units were permitted in 2007. Once the housing crisis hit, demand plummeted. In 2009, only 20 units were permitted. Most other industries were relatively insulated from the recession. Browning, a sporting equipment manufacturer and wholesaler, and the largest employer in the region, was able to hold employment steady. Holcim, a concrete manufacture and the second largest employer, did the same. These core industries’ stability helped to mitigate constructions job-loss effects as local demand remained consistent and health care, education and retail all weathered the storm relatively well. Morgan County turned the corner at the end of 2012, and has been growing at an average annual rate of 5.0 percent since. New growth in health care and retail are driving the recovery. New single-family home construction is on the rise but has yet to return to pre-recession levels. 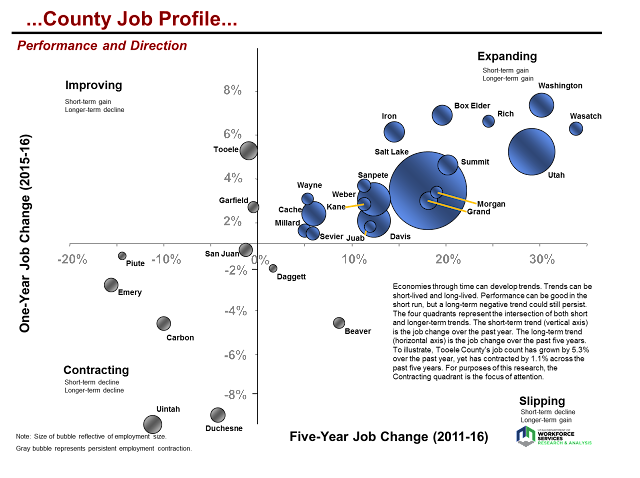 By 2015 the county had recovered to its pre-recession peak and is now sitting at more than 2,200 jobs. How Online Sales are Changing Retail Jobs in Northern Utah. Broad-category examples of retail trade sectors are motor vehicle sales, furniture stores, electronic stores, building material stores, grocery stores, pharmacies, gas stations, clothing stores and department stores, among others. Then there is the relatively new and emerging part of the retail trade sphere — nonstore retailers. These are establishments that sell products on the internet. Examples include Amazon, Zappos, Overstock.com, or eBay. These types of retailers have grown rapidly in the past 15 years and their presence is reshaping the retail trade landscape. We do not yet know how much brick-and-mortar erosion will eventually occur. And will such a phenomenon hit some areas more than others (e.g., urban vs. rural, or local vs. tourist spending)? These are touch points that economist will be watching as this internet sales phenomenon continues to grow within the national and Utah economies. The retail trade industry is an important economic driver in the Wasatch Front North. It employs nearly 28,000 people in the region — more than 12 percent of total nonfarm employment. In Davis County, retail trade employs a larger share than any other industry, and in Weber County it is the third largest employer behind manufacturing and health care. Retail sales account for some 57 percent of total taxable sales in the region — a considerably larger share than the 52 percent statewide average. Due to consumers making more and more purchases online, the demand for brick-and-mortar retail workers in the region has been softening. Overall, employment in the Wasatch Front North has been growing at a rate of about 3 percent on average since the end of the recession; but in traditional retail, employment has been averaging just 1.7 percent. Prior to the recession — and before online retail really took off — traditional retail employment was clipping along at a much quicker average rate of 2.4 percent growth. Non-store retail, on the other hand, has been booming in the region. With the arrival and expansion of major online retailers, like Wayfair in Ogden, employment in non-store retail has grown an average of 19 percent annually since 2010. The share of total employment represented by non-store retail has increased 137 percent over that time. The next highest employment share expansion in retail was in the miscellaneous category (e.g., pet stores, office supply stores, florists), which increased its share by a paltry 10 percent in comparison. Most other retail categories saw a decline in their share of total employment. Non-store Taxable Sales Are Gaining, But Not as Fast as Employment. Why? Taxable sales in non-store retail have not gained as a share of total taxable sales as quickly as the employment share has increased. This is primarily because sales taxes are collected by the state of the purchaser, and then, only if the seller has a physical presence in that state. This means that when Wayfair sells a rug to someone outside of Utah, there is money coming into Utah (in terms of the jobs that the sale supports) but there is no sales tax coming in to Utah. The only non-store sales taxes captured in Utah are Utah consumers purchasing goods from retailers with a presence in Utah. Since a large share of sales by local online retailers are to customers in other states, it means that sales tax revenue lags compared to employment growth in the industry. Interestingly, the jobs in retail are not primarily younger workers as one might expect. In fact, about 70 percent of the region’s retail jobs are people 25 and older, and approximately 50 percent are at least 35. There used to be more young workers in the industry. Prior to the recession in 2007, the share of 35 and older retail workers in the Wasatch Front North was just 40 percent. During the Great Recession, the share of teenagers working in retail plummeted from over 10 percent to about 5 percent and has remained low ever since. The reduced youth base means there are fewer workers who stay on and age into the older categories. At the same time, the share of retail workers with less than a high school education has increased significantly. This has been primarily at the expense of individuals for whom educational attainment data are not available (i.e., workers under the age of 24 — mostly students). Since 2007, the share of workers with less than a high school education in Utah retail has increased by more than 25 percent. This does not appear to be an actual increase in less educated workers. Rather, the drop in workers under 24-years-old is causing a share increase for the existing less educated workers. As a result, the retail workforce in the Wasatch Front North (and in Utah in general) is trending toward an older and less educated demographic. Much of this trend is likely the result of young people choosing to take jobs in other industries with better pay, as wages in retail have suffered. Or they may be opting to finance their education rather than work while attending school. But some portion of this shift is also being driven by the structural changes taking place in retail due to increasing online sales. The transition to non-store retail translates to shifting demand for a different set of occupations required by non-store retail operations. Traditional brick-and-mortar retail stores primarily need people to work on the sales floor, such as retail sales workers and cashiers. Those two occupations alone represent about 45 percent of all employees in traditional retail. In non-store retail, on the other hand, the top two occupations are customer service reps and shipping/receiving clerks. Freight and inventory movers, order clerks/fillers, and truck drivers all play a much more prominent role in non-store retail as well. Generally speaking, these kinds of jobs tend to require more time commitment than the most demanded traditional retail jobs. According to the Conference Board’s Help Wanted Online® product (analyzes online job postings), about 40 percent of job openings for cashiers and retail sales workers (the top jobs for traditional retail) posted in Utah in the second quarter of 2017 were part-time jobs. Only 20 percent of job postings for customer service reps and shipping/receiving clerks (the top jobs for non-store retail) were part-time. Positions that require more time commitment and more fixed schedules are likely to be less attractive to young people — especially students — who may be looking for opportunities that are less time consuming. In addition, there is a geographic component to this transition. Traditional retailers tend to have many more locations spread out geographically, making them more likely to have that cover a broader footprint within the labor force. Online retailers, however, are generally centralized in large warehouses, distribution centers, and office buildings that runs counter to the disperse spread of traditional brick-and-mortar. As a result, it may be harder for workers — especially younger workers — to get to and from these jobs. These structural changes are having a profound effect on the retail workforce, and we can reasonably expect the resulting trends to continue for some time. As new technologies and retail processes emerge, there will doubtless be more shifts in this rapidly evolving sector. But for now, in the Wasatch Front North region, we can expect fewer traditional brick-and-mortar retail jobs, more non-store retail jobs, and an increasing share of retail employment opportunities that may be challenging for our young population to access. If you are interested in the details, the data visualization below breaks out the various retail categories and allows you to compare sales (as a share of total taxable sales) and employment (as a share of total nonfarm employment) in each category (by county) over time. The relative changes in taxable sales compared to employment are telling in relation to some of these structural changes, although direct links are difficult to establish as there are many other confounding factors. The tables at the bottom give the actual sales and employment levels, summed-up for whatever you have selected in the county and retail category filters. 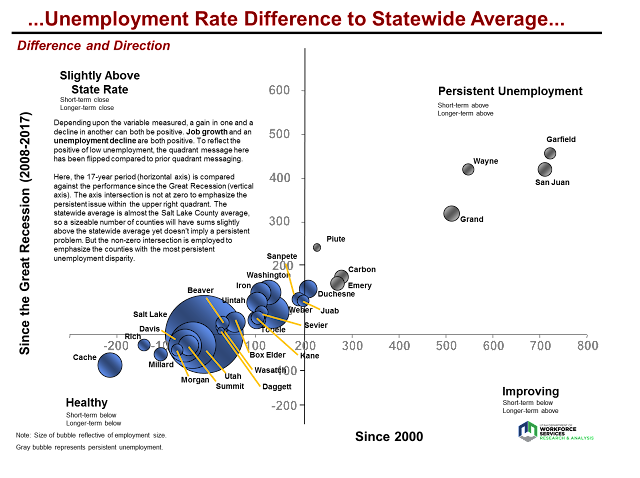 Across the United States, jobs are quantified through each state’s unemployment insurance program. Those programs provide the potential for laid-off workers to receive unemployment benefits — the goal being to bridge the gap between workers’ lost jobs and their next jobs. An eligible recipient’s weekly benefit amount is based upon their earnings from recent work. This begs the question, how does Utah’s unemployment insurance program know how much an individual recently earned while working? That answer is supplied by all businesses that hire workers, as they must report their employees and pay as mandated by the unemployment insurance laws. Companies identify their individual workers and those workers’ monetary earnings for a calendar quarter. As businesses are identified by their industrial activity and geographic location, it is through the unemployment insurance program that aggregate employment counts by industry and location are calculated. Yet each state’s profiling of individuals is quite minimal in the unemployment insurance program. The U.S. Census Bureau can bring more light to the overall labor force by supplementing said information with gender, age, race/ethnicity and educational attainment (imputed from American Community Survey responses) for Utah’s labor force. The Census Bureau packages this information through their Local Employment Dynamics program and makes available said data on its website. Here at the Department of Workforce Services, we recently downloaded and packaged Utah-specific data from said website and summarized it in the attached visualization. Various data “tabs” are available, presenting Utah’s economy from different angles, ranging from industry shares within the economy to the age-group distributions of the labor force, to gender and race distributions. These labor variables can be viewed for the state as a whole, or by each individual county. Industry — industrial distribution is quite diverse, which provides strength within the economy. Distributions do fluctuate with time, with manufacturing seeing its share lessen while health care and professional and business services shares have increased. Age — the bulk of Utah’s labor force is composed of 25- to 44-year-olds. Older worker shares have increased over the past 15 years, yet still remain a non-dominant portion of Utah’s labor force. The youngest segments of the labor force declined noticeably during the Great Recession due to less participation, and that trend remains. Educational Attainment — turnover rates are understandably highest with workers under the age of 25 as they strive to build their educational foundation and also find their niche in the labor market. A trend does stand out where the more education that a worker attains, the lower the turnover rate businesses experience from said educational classes. Race/Ethnicity — Whites account for around 80 percent of Utah’s labor force. The Asian community is small but slowly increasing in share, and is also characterized with the lowest turnover rate and the highest new-hire wages. Gender — males comprise about 55 percent of Utah’s labor force. The female share of 45 percent is higher than the national average. Roughly 35 percent of working females work part-time compared to 15 percent for males. Therefore, female new-hire wages are considerably lower than male new-hire wages. (Note: employer reporting into the unemployment insurance system is not hourly wage rate reporting but instead total calendar quarter wages paid. Therefore, calculations can only be made upon total quarterly wages, and part-time employment weakens this measure). Retail/wholesale trade industries dominate in Davis County with more than 16 percent of employment. This share has been in decline, however, since the end of the recession – not due to a decline in these industries, rather, due to increased growth in professional and business services, which includes management/scientific/technical consulting services. Alone, this sector has added more than 1,000 jobs over the last 10 years. In just the last two years, construction and manufacturing have both begun to regain some of the share of employment lost after the recession. Non-residential building construction in particular has added about 500 new jobs since 2013. Perhaps surprisingly, Weber County has an even larger share of employment in retail/wholesale trade than Davis County – nearly 17 percent compared to 16 percent, but that is primarily due to the wholesale portion of that sector which has a large grocery and related product merchant wholesaler employer in the Ogden area. Manufacturing and professional/business services both compose large shares of Weber County employment, about 14 percent and 15 percent respectively. However, the health care/social services sector has been increasing its share over the last 15 years more than any other sector. In 2000, the sector’s share was about 9 percent and now it’s nearly 13 percent – a major shift. In particular, over that time, the general medical and surgical hospitals industry has added more than 2,000 new jobs, primarily driven by the new McKay-Dee Hospital facilities and service expansions in Ogden in the early 2000s. In Morgan County, the largest share of employment is in the retail/wholesale trade sector as well, at about 20 percent. Like Weber County, this is largely due to the wholesale industry since Browning, the largest employer in the county, is classified as a wholesaler. Construction is the next largest sector, although it has been trending toward a smaller share since the end of the recession. The number of employed in construction has not changed much in the last 15 years, averaging between 300 and 350 workers, but the health care/social assistance sector has been growing quickly – from about 25 jobs in 2000 to more than 170 in 2016, thus edging out construction’s share of the pie. Residential care facilities and ambulatory health service have been driving that growth. Better, Faster, Smarter... Check out our new website design! Information is the treasure of the current age. The instant access to information since the advent of the Internet has transformed societies in ways that thousands of years prior had not. Information can lead to knowledge, and — with increased knowledge — better efficiencies and way of life. If information is vital, then the presentation of information has also risen to a prominent level. With this, the Utah Department of Workforce Services has made some organizational improvements to its economic webpages. Various economic data categories are not mutually exclusive, but we made an effort to compartmentalize economic data for a better organizational display and navigation. We also added a new feature area that taps into various national data elements and measurements from the Federal Reserve Economic Data (FRED), the database of the Federal Reserve Bank of St. Louis. FRED’s added value is national — and Utah — economic indicators. More on FRED’s contribution below.  Depending on the subject, economic data can be categorized as either broad or specific. For example, the demographic makeup of an area and how that impacts an economic structure is a broad-subject approach. Conversely, a current monthly snapshot of the Utah economy, its job growth and unemployment rate is a more specific observation. Our economic webpage has four “portals” through which to “categorize” and search for information. One portal is broad, while the other three are more specific in nature. The monthly employment profile just mentioned is a specific topic and gets its own “portal,” entitled Employment Update. Here, the most current Utah economic performance can be explored and summarized. The information found here is what often gets cited in the local news media in reference to the current Utah job performance and unemployment rate. The second specific “portal” is labeled Local Insights. This is a quarterly profile of the Utah economy down to a county level. Each county is summarized with its own economic performance, including job growth, unemployment rate, housing starts, taxable sales and other profile variables. The common theme here is a county-specific approach. The third specific “portal” is Reports and Analysis. 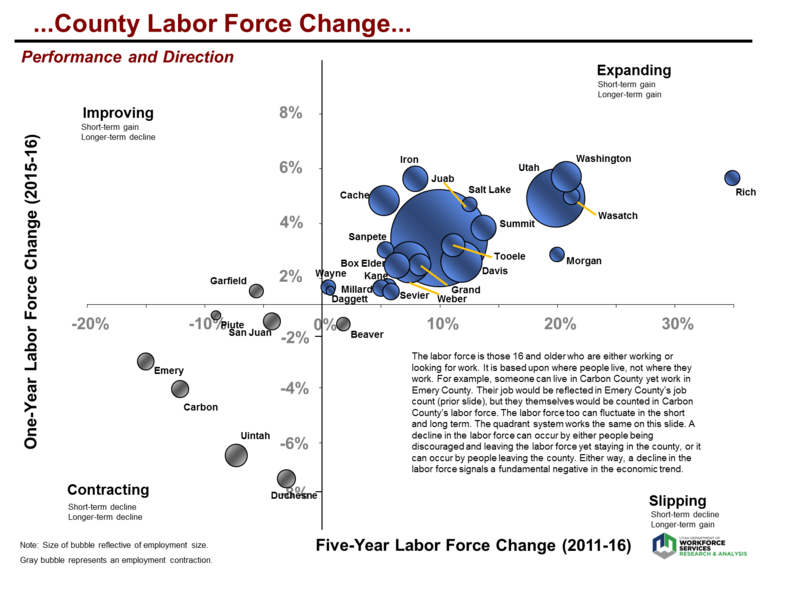 Workforce Services’ economic forte is the labor market. Things over and above the everyday reporting on the labor market are presented here. Sometimes we do special economic studies, other times we will report on specific economic groups within the labor force, like women or veterans. Anything we do that is not an often repeated or ongoing report are grouped here. The final “portal,” and possibly the one that will be most used, is labeled Economic Data. The core of our data collection and analysis is concentrated here. Employment data, occupational data, wage information and demographic profiles are just some of the major economic themes found in this area. As mentioned earlier, we have added an economic indicator area tapping into FRED, which is a massive compilation of economic data from various sources — primarily government statistical agencies, but also some nongovernmental organizations. Workforce Services economists have gone through the list and selected a handful of the most useful data series for gauging the performance of Utah’s macro economy and gaining insights into expected trends. Utah functions within the national economy, so the national economic indicators profiled here are intended to also be guiding influences on the Utah economy. These indicators include composite indexes; a recession probability indicator; leading indicators, such as construction permits and the yield curve; coincident indicators, such as real GDP and employment; and price indicators, such as the consumer price index, regional housing prices, and oil and gas prices. Each chart has a detailed description of what the data represent and how they may be useful. Keeping relevant with the fast-changing pace of the Internet and data presentation is our goal at Workforce Services. We hope these changes help to better present our broad package of economic data offerings. The projected occupational growth rate in the Ogden-Clearfield MSA (which includes Box Elder, Davis, Morgan and Weber counties) is similar to the rest of the state on average at 2.6 percent annually through 2024. Utah statewide projected growth is 2.7 percent. The 12,120 projected annual openings in Ogden-Clearfield MSA from 2014 to 2024 represent about 17 percent of all projected openings in the state. The occupations with the highest growth expectations are, on average, those that require the most education. Jobs that typically require a doctoral or professional degree are projected to grow 3.4 percent annually through 2024. Growth in openings for postsecondary teachers of business, criminal justice and health specialties are the primary drivers of this trend. Occupational expectations in construction and production (i.e., manufacturing) are noteworthy in the Ogden-Clearfield region as well. Both of these categories are already supplying large numbers of annual openings and are still expected to grow at more than 3 percent every year. Jobs in these areas typically don’t require as much education but offer relatively good wages. Electricians, for instance, have a strong demand outlook. They typically require an apprenticeship but no college education, and they earn a median wage in the region of nearly $48K per year. Machinists, similarly, are expected to have plenty of job opportunities through 2024, while requiring only some college or long-term on-the-job training. In the Ogden-Clearfield region, they earn a median wage of $52K per year. Jobs in engineering and information technology (IT) are also expected to continue growing at more than 3 percent annually over the next eight years; and, together, are projected to produce nearly 600 openings per year in the region. Jobs in engineering and IT tend to offer high wages for the level of education required. Mechanical engineers, for instance, are in high demand (about 70 openings per year in Ogden-Clearfield). They typically require a bachelor’s degree and earn median wages of $81K per year. Another example is applications software developers who make median wages of $74K per year and have job opportunities projected to grow at 3.5 percent annually (about 40 annual openings in Ogden-Clearfield). There are many other occupations in the region that are projected to offer excellent opportunities as well — industrial machinery mechanics, dental hygienists, industrial engineers, electronics engineers and computer systems analysts to name just a few. 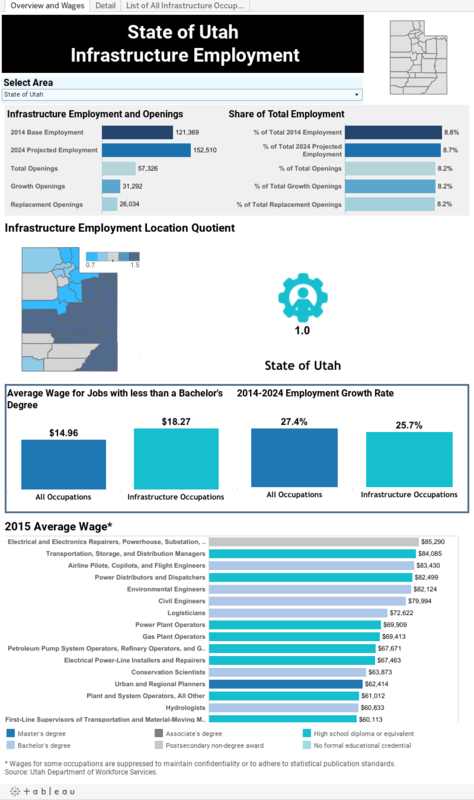 You can learn more about these occupations and others through the Utah Occupational Explorer where you can explore and compare occupations of interest in detail by region, wage level, typical education required, projected growth and demand. Before digging into the details though, take a look at the interactive data visualization above to see the big picture of the occupational outlook for the Ogden-Clearfield MSA. Fortunately, that statement is not true. Yet society still looks to the government to provide answers to comprehensive and complex questions that have their foundation within individual decisions and activities. One subject frequently directed toward the government is individual-level information about the economy — particularly, what occupations are in demand, what occupations pay well and have lucrative outlooks, and ultimately, what occupation(s) should I build my career upon? It takes the accumulation of a wide array of individual information to answer these questions. Employers provide the foundation information about the occupations they employ. Jobs are held by individuals, but employers provide the profile information about the job itself, not any particular individual. Since society desires to profile such a broad spectrum of the economy — occupational profiles and the occupational distribution within the economy — only government is in the unique position to collect, analyze and provide answers for said desire. Yet, no government program or regulatory agency mandates any comprehensive occupational reporting from individuals or businesses. Therefore, government attempts to fill the void with an ongoing, robust and voluntary survey of employers — a survey where employers are asked to provide details about their various occupations, including descriptions, quantities, wages/salaries and location. Through this survey emerges an occupational portrait of an economy. The U.S. Bureau of Labor Statistics (BLS) structures and funds the survey, yet the individual states conduct the survey. Under BLS administration, all states use the same methodology; therefore, occupational profiles are comparable across states. Through this survey, analysts discover how industries are populated with various occupations. Accountant is an occupation, yet accountants can be found across many different industries. Other occupations may be more exclusive to certain industries; for example, doctors are largely found only in the healthcare industry. One of the survey’s products is that industries can be profiled with their general mix of occupations. This is called an industry’s occupational staffing pattern. This brings us back to the original questions: what occupations are in demand, what occupations pay well and have lucrative outlooks, and ultimately, what occupation(s) should I build my career upon? The foundation is to make informed forecasts about how industries will expand/contract over the next 10 years. By applying existing occupational staffing patterns to each industry’s projected change, a trained economic analyst can then make an extrapolation about how occupations will correspondingly increase/decrease. Knowledgeable analyst judgment further refines the occupational expectations, such as knowing an occupation will grow faster than in the past, with the result being a set of occupational projections that accumulate to profile a state or regional economy. A new set of occupational projections are done every two years to keep the information fresh even though economies do not change dramatically in short order. Because of slow change, updated occupational projects generally continue the overall message of preceding occupational projections. But economies do modify with time, and therefore, subtle changes will arise with each new set of occupational projections. Utah’s most recent occupational projections are found here: http://www.jobs.utah.gov/wi/pubs/outlooks/state/index.html. These projections look forward to the year 2024. The occupational profile is structured from the general to the detailed, mimicking the structure of a family tree. First, broad occupational categories are defined, such as management or healthcare occupations; then, subcategories are defined; and finally, individual occupations are defined. Individual occupations are the heart of the occupational projections. But overall patterns and characteristics do emerge when observing the broader categories. 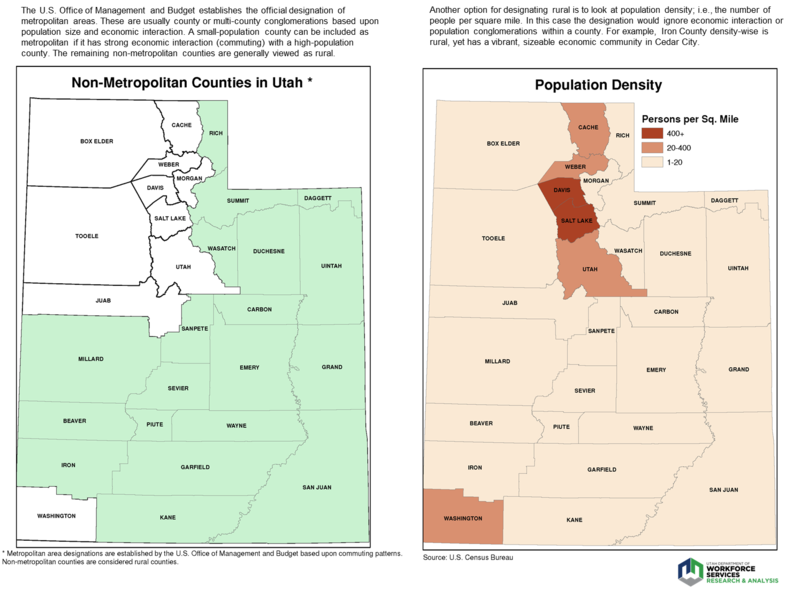 While a Utah statewide profile leads the way, Utah’s local economies are not homogenous; therefore, nine Utah subregions are also profiled. Due to confidentiality restraints and statistical reliability, the amount of occupations available will diminish the smaller a subregion; but, occupations comprising the backbone of a regional economy will be available. The labor force is made up of people. People vary in every conceivable way. One person is artistic while another can only draw stick people. One person might be able to disassemble and reassemble a car engine while another might not know what an alternator is. We are different. We have different aptitudes and abilities. Parallel to this variability, jobs are different. High levels of education do make it possible to work in high-skill occupations that return high incomes. But not everyone is cut out for higher education or has the means to obtain higher education. Therefore, they might end up in “lesser” or “unimportant” jobs. But is that accurate? Are their job options inferior and unimportant? A recent Brookings Institution report brings to light a segment of the economy that is highly important yet is dependent upon the labor force that may not be built for, have the economic means, or desire to attain a college degree or higher. Brookings identified 95 occupations that support the infrastructure foundation. Their work was well founded and designed. This intrigued us to develop a profile of said infrastructure configuration for the Utah economy. We could not replicate the Brookings work in terms of finalizing upon infrastructure industries, but we could place our focus instead upon all infrastructure occupations. Infrastructure occupations do not have to be found in only infrastructure industries. A helicopter pilot, an infrastructure occupation, may fly a medical helicopter for a hospital, even though said hospital is not categorized as an infrastructure industry. What is important is that there are occupations that Brookings has identified as key occupations that help to keep the economy operating, growing, designed, and governed. And a practical appeal is that many of these jobs offer low barriers to entry while supplying competitive wages. Across the nation, these occupations number 11.9 million, or 8.8 percent of all occupational employment. In Utah, these jobs number around 121,400, also 8.8 percent of all occupational employment. Again, the appeal of these jobs is not just that they fundamentally support so many other jobs and industries in the economy, but that these jobs don’t require a high level of education or formalized training for entry. Oftentimes these occupations emphasize only on-the-job training. Yet, these jobs pay on average 22 percent higher in Utah than other occupations that are willing to accept only a high school diploma or less. Utah does have its unique structuring across its different geographic regions, and this will include the possibility of a different profile of the Infrastructure economy in each local region. The following is an Infrastructure profile for the Ogden-Clearfield region. Infrastructure occupations in the Ogden-Clearfield MSA, (which includes Davis, Morgan, Weber and Box Elder counties), comprise 8.7 percent of total employment. In particular, the area is a warehousing and distribution hub, so there are high levels of related occupations such as truck drivers, freight movers, and package handlers. In addition to distribution activity, there are many infrastructure jobs surrounding Hill Air Force Base and corresponding aerospace industry. Avionics technicians and logisticians, for example, are concentrated in the Ogden-Clearfield MSA at a rate more than 5 times that of the U.S. average. Control/valve installers and aircraft mechanics/service technicians are also highly concentrated here– both nearly 4 times that of the U.S. average. The oil refineries in Davis County also contribute a significant number of infrastructure jobs. Gas compressor/gas pumping station operators and petroleum pump system operators/refinery operators/gaugers are employed in the Ogden-Clearfield MSA at a concentration nearly 3 times that of the U.S. average. These infrastructure jobs compose the backbone of the local economy and provide the very structure and support upon which a community can grow and thrive. As such, it’s appropriate that these individuals tend to be paid higher wages. Compared to other individuals with similar levels of education, infrastructure workers in the Ogden-Clearfield MSA make about 23 percent more on average ($18.24 per hour versus $14.89 per hour).